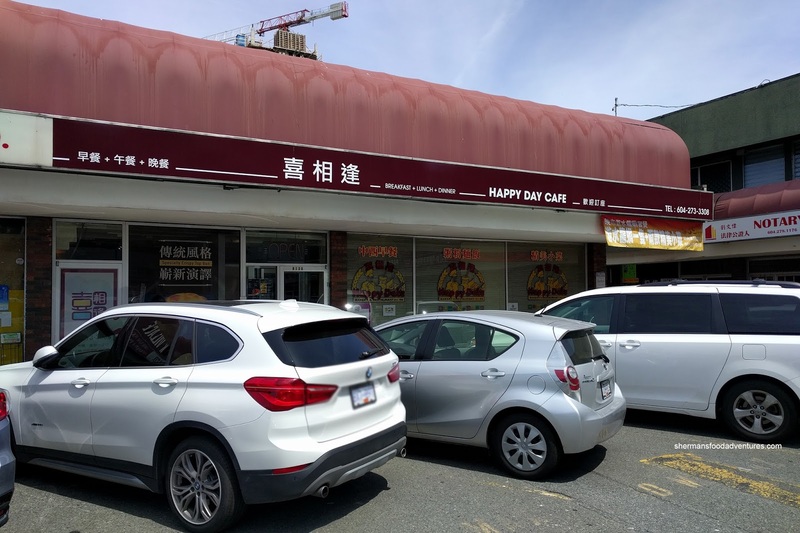 After our visit to Happy Day Cafe on Kingsway at Joyce, we came away slightly disappointed. It wasn't as if the food was bad per se, but it just wasn't as good as we envisioned and the pricing seemed high. This was a surprise since the original location Happy Date in Richmond was inexpensive and consistently good. Well, we decided to give it another go at Happy Date only to find out they had rebranded to Happy Day Cafe. I guess there will no further confusion since they share the same name now. But what about the food? We arrived just as breakfast was ending and lunch was starting. As such, we ordered both! 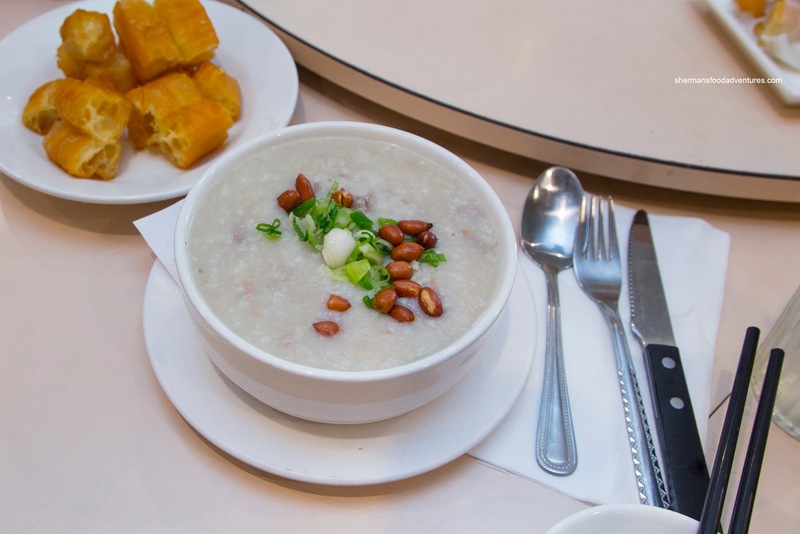 For the breaky, we got the Minced Beef Congee with a side of Donut Rice Noodle Roll. 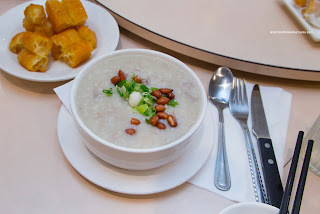 The congee was certainly thick and remained that way until the last spoonful. It was mildly seasoned where it wasn't too "restaurant" tasting. There was just enough tender nuggets of beef for effect, but I would've liked a bit more. As for the donut rice noodle roll, it was pretty good. The salty donut was crispy and fairly airy while not overly greasy. 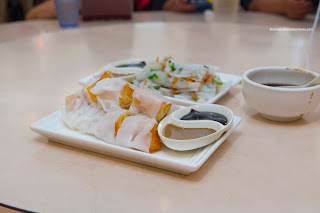 On the outside, the rice noodle roll was fairly thin and showed good elasticity while being soft. 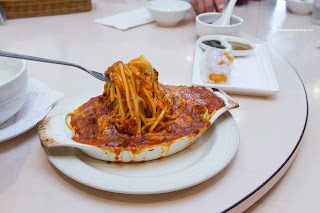 We also got a few lunch items including the classic Spaghetti Bolognaise which was also quite good. It featured noodles that were between soft and al dente (which is pretty good for HK-style restaurant standards). 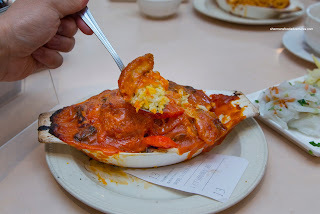 On top, there was a rich meat sauce that wasn't too starchy and actually quite cheesy. There was a decent amount of tender beef bathed in a savoury and sweet sauce. I thought the Pork Chop Rice to be the better of the two as it featured a good amount of tender and lean pork chop. I would've liked it to be crispier, but the amount of sauce probably had something to do with it. It was tangy and slightly sweet where there was enough of it for the rice. Much like our visit to the Kingsway location, we armed ourselves with a bevy of loaded Pineapple Buns. 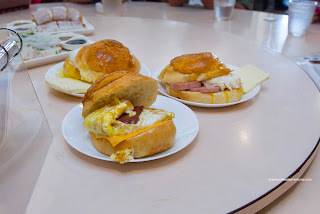 Although these didn't challenge Lido nor AAA for the best in town, they were respectable nonetheless with a soft, but slightly dry bun. 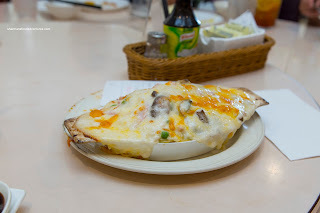 Inside, the egg, meats and cheese helped moisten thing sup as well as providing a salty balance to the sweet topping. The last dish at the table was the Creamy Ham Spaghetti which was pretty textbook. It featured a mild-tasting starch-thickened milky sauce atop relatively chewy noodles. Personally, I'm not a huge fan of Chinese starchy cream sauces, so I enjoyed the meat sauce more. In the end, this visit to the Richmond location of Happy Day yielded better results than the Kingsway location. Is it just luck or is the Richmond one better?